8.10 points at 49 votes (rank 67). 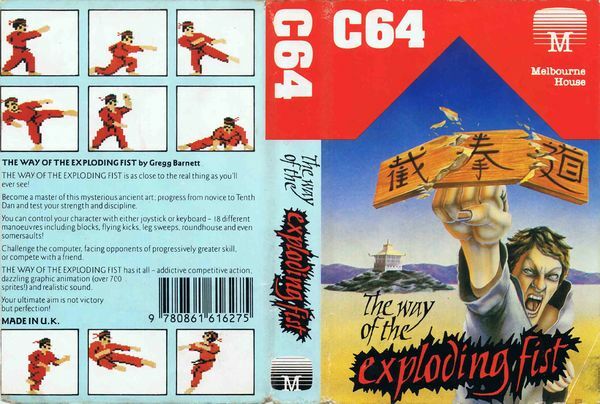 The Way of the Exploding Fist is a karate simulation for the C64. You can choose to compete against the computer or a human player. When fighting against the computer you have each only one live. When reaching full two points, you will win the fight. After the time has run out the referee decides who has won. After two won fights you get into the next arena of which there are altogether four. Your "skill" then rises from NOVICE to 1st Dan and so on. The computer enemy gets correspondingly stronger. Graphically very pleasant 2d design, fighting screens, kicks and punches can be heard well (samples), very nice background music by Neil Brennan. Depending on the direction of the joystick you can creat the corresponding kick or movement. There are 15 actions and the movement to the left and right. The strategy: there are the usual kicks and punches, which appear in every karate game. If you want to get many points, there are only three of them sensible; high punch (top right), the jab (bottom right) and low-kick against the leg (bottom right with fire). These three techniques are the fastest, all the other kicks need too long until they are conducted, a time in which you are vulnerable for the enemy. Distance is very important. You must not stand so close to the opponent, that you can be hit with a fast technique, because you cannot defend yourself against it. If you stand too far away the enemy has time to parry a counterattack and you are suddenly in a dangerous, because uncontrollable close combat. The right distance are 4 to 5 pixels between the hands of the sprites. Very important: never let techniques "stand around" by keeping the fire button pressed. You are vulnerable with a leg or an arm in the air. Equally important: always hit or defend only once, permanent fire orgies are only suicide. Mostly the enemy tries to attack with two combinations: the jumped foot kick is easy to counterattack. As soon as the opponent jumps, defend (step to the left). As soon as the opponent lands you can knock him out with the fist punch. The other technique is a foot sweep. The opponent knees and pulls your feet off the ground. This technique is not hazard-free, as it has a great reach. The counterattack, however, is actually rather simple. If the distance is right, you just have to go one step away from the enemy, as soon as he kneels down and then charge again. While he is getting up, you can then knock him out with a low-kick. In close combat you should change between attack and defense quickly and in the right rhythm. The aim is to safely gain distance. As long as you stay cool, you can relatively easily manoeuvre yourself into a good fighting distance and can let the opponent come. In "The Way of the Exploding Fist" you are more successful when fighting from the defensive. After each last opponent in front of the Buddha statue, a buffalo comes stomping through the scene from the right. You can either jump over it with a salto or sent it to buffalo-sleep with a well-aimed low punch. 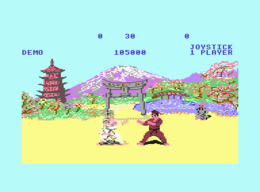 Nele: "The Way of the Exploding Fist" is in my opinion quite the best beat'em up of all, because here it does not depend on joystick stirring, but on good timing, chosing the appropriate punches and kicks and the right strategy. Furthermore, it's one of the very few beat'em ups where the defense (just going one step away from the opponent) actually works and can be used sensibly. Voting 9 (for 10 I would have wanted a few more backgrounds and more sophisticated computer tactics. FXXS: "I cannot see the big difference to International Karate, I find graphics and music a bit worse and the controls take getting used to... therefore good 8 points." mombasajoe: "A much better atmosphere than in International Karate is unfortunately clouded heavily by the slow animation and controls. What a pity 6/10!" Shakermaker303: "Very pleasant design, the backgrounds are designed nicely, the music is promsing, diversified and partially "ruminant" - appropriate for a karate game. The moves are specific, however, only the courses of movement - in comparison to Int. Karate (for me THE benchmark concerning martial art games on the C64) and a few other good karate/Kung Fu games a bit too slow. Therefore "only" 9 out of 10 points." Blubarju: "Atmosphericaly the best fighting game on the C64. Even though the gameplay is a bit slow. 8 points." The game was awarded the British Golden Joystick Award in the category Game of the Year in 1985. This page was last modified on 11 August 2017, at 19:03.